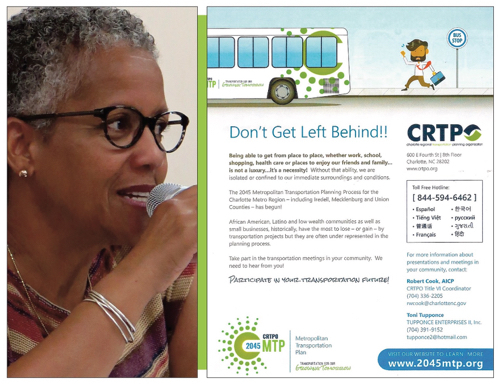 Governments plan transportation projects way ahead of when the bulldozers roll, says Charlotte Regional Transportation Planning Organization consultant Toni Tupponce. And when the bulldozers begin to roll, it’s too late to have much impact on whether the project will be built, how it will look or how it will serve its neighbors. So Tupponce was at the Forum this morning to encourage residents of Iredell, Mecklenburg and Union Counties to pay attention, attend planning meetings and watch for the signs. What are the signs? Suppose a number of houses in your neighborhood become vacant at the same time. That can be a sign that a government entity is preparing to expand or create a new roadway. Tupponce acknowledged that many people are busy enough just surviving and don’t have time to attend meetings. She suggested that people find in their various groups someone who does have the time who will attend and then communicate what is going on with other members of the group. Tupponce shared these materials about transportation planning. During Tupponce’s appearance, she also spoke and answered questions about the Sign of the Times, a performance group dedicated to “preserving the legacy of the African Diaspora through music, dance and the spoken word.” That material is on a page here, but the presentations and Q&A are wound up together in the video below. Tupponce’s presentation on transportation planning begins at minute 8:53 and concludes at minute 20:26. The combined Q&A begins at minute 36:33.